Apple is lowering prices for the military. 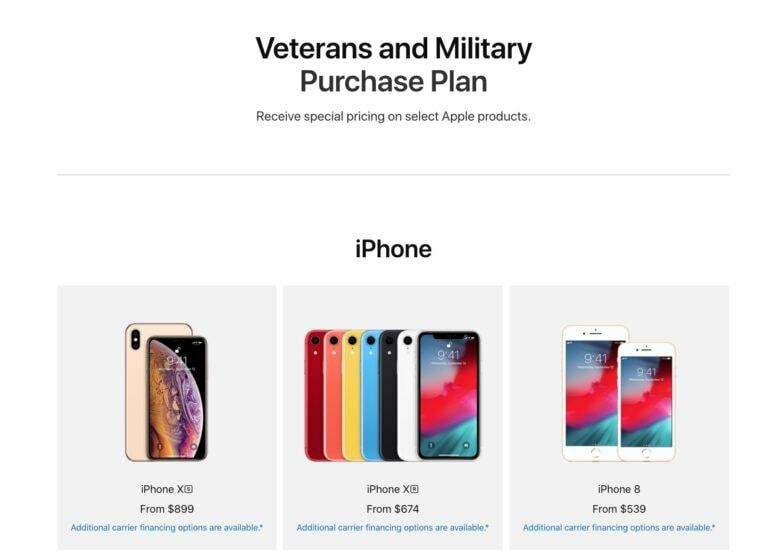 Buying a new iPhone XS just got a lot more affordable for anyone that has served is or is currently surviving in the U.S. Military. Apple revealed today that it has launched a new website that gives a 10% discount to vets and active military members that the company says is an expression of its gratitude for service. The new subsite is similar to the education store that offers discounts to students and teachers. Just like the education store, the military and vets site doesn’t ask for verification so it’s all based on the honor system. The iPhone XS is $100 cheaper on the military site at $899. Apple dropped the iPhone XR pricetag from $749 to $674. The iPhone 8 and iPhone 7 are also offered at a discounted price, but the iPhone XS Max doesn’t get a price drop. There are also discounts available on the Mac, Apple Watch, iPad, HomePod, Apple TV 4K, HomePod and some accessories. Most of the discounts are better than the ones found on Apple’s educational store.